Origin Green is Ireland’s national food and drink sustainability programme. It is the first and only sustainability programme that is run on a national scale, uniting government, private sector and food retailers through Bord Bia, the Irish Food Board, who are the semi-state body responsible for promoting Irish food and drink, both in Ireland and in international markets. Bord Bia’s mission is to drive through market insight and, in partnership with industry, the commercial success of a world class Irish food, drink and horticulture industry. Ireland enjoys a strong reputation as a source of high quality food, drink and ingredients, with a temperate climate and green countryside, putting the country in a strong position for sustainable food and drink production. Agriculture is a very important industry in Ireland and therefore Bord Bia are taking great care to make sure food is produced in a sustainable way for future generations. This is where Origin Green comes into play. Origin Green was first launched by Bord Bia in 2012. As a programme, Origin Green covers the full food and drink supply chain. Farmers participate in Bord Bia’s Sustainable Quality Assurance schemes. Food manufacturers sign up to the sustainability charter and develop a dedicated multi-annual sustainability plan and retail and foodservice operates also develop a sustainability plan. At each stage, the programme is independently verified and audited to ensure robustness and credibility. Origin Green now covers all levels of the supply chain, an ambition of the programme from the very outset. Bord Bia has been auditing and certifying good farming standards for over twenty years through its Quality Assurance schemes. Quality Assurance plays a fundamental role in promoting Irish food and horticulture, and provides a platform for consumer promotion of product quality. The schemes are built on best practice in farming and processing, current legislation, relevant industry guidelines and international standards. Bord Bia’s Quality Assurance schemes are accredited to the ISO17065/2012. Food safety, traceability, welfare, health and safety and environmental protection are the cornerstone of the standards. In 2012, Bord Bia made plans to transition these Quality Assurance Schemes to Sustainable Quality Assurance Schemes. This has involved incorporating sustainability initiatives and measures into the existing Quality Assurance audit, including areas such as biodiversity, use of water and social sustainability. Farms that are part of the Sustainable Quality Assurance Schemes are audited every 18 months, where data is compiled regarding the sustainability performance of the farm. Following their audit, each farmer is given a feedback report, which outlines ways in which the farmer can improve sustainability on their farm. In 2014, Bord Bia introduced the Sustainable Dairy Assurance Scheme (SDAS), the first Quality Assurance scheme to have sustainability at its core. Today, over 85% of Ireland’s 18,000 dairy farmers have signed up to the scheme and it is expected that 100% of all of Ireland’s dairy farms will be signed up to the scheme by mid-2018. In addition, the former beef and lamb Quality Assurance scheme has become the Sustainable Beef and Lamb Assurance Scheme (SBLAS). Launched in April of this year, the scheme has 50,000 farmer members and over 165,000 carbon audits have been conducted on beef farms to date. In November 2017, Bord Bia launched the Sustainable Egg Assurance Scheme, which marks the third farmer scheme to be converted to a Sustainable Assurance Scheme. It currently has over 240 certified members, covering 97% of Ireland’s egg production. Bord Bia are currently in the process of converting all Quality Assurance Schemes to Sustainable Quality Assurance Schemes. 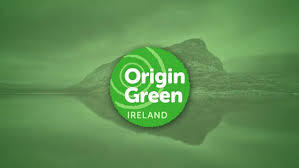 Ireland’s food processors and manufacturers sign up to the Origin Green charter and develop targets within the areas of raw material sourcing, manufacturing processes and social sustainability. The targets set are specific, measurable and ambitious. Throughout this initial plan development stage, Bord Bia offer companies a range of support including workshops, guidance documents and one-to-one mentorship. Once a company’s sustainability plan is completed, it is sent to SGS, a leading inspection, verification and testing company, for verification. Verified members of the programme must also submit an update to their plan on an annual basis, where they report on progress regarding their targets. These annual reviews are also verified by SGS. The manufacturing element of Origin Green began with nine companies participating in a pilot phase of the programme in 2012. Today, the programme has surpassed 275 verified members. Each sustainability plan is independently verified by the SGS Group, which assesses the company’s progress in relation to targets set out in their individual charters. An ambition of the Origin Green programme from the outset was to engage the entire Irish food and drink industry in sustainability. A milestone Origin Green hit in 2016 was extending the programme to retail and foodservice level, thereby including the entire supply chain. Companies at this level also develop a sustainability plan, encompassing areas such as raw material sourcing, operations, health and nutrition and social sustainability. Currently at the pilot stage, the Origin Green Retail & Foodservice Charter currently has 6 verified members, and Bord Bia are currently engaging with other companies in this area. A key element of the Origin Green programme is that each sustainability plan is tailored to that individual company, so that the focus can be placed on the areas most relevant to them. These are medium to long-term plans, typically lasting 3 – 5 years in duration. Now, 5 years after the programme’s inception, early adopters of Origin Green are moving on to their second plan, demonstrating ongoing commitment to the programme. Many of the Origin Green pilot companies have made significant resource savings over the duration of their plans and have won awards for their sustainability performances and credentials. Origin Green has been well received internationally with recognition from Jason Clay, the vice president of the World Wildlife Fund and the president of the World Bank, Jim Yong Kim, both endorsing the programme as a positive example for others to follow. Furthermore, the Origin Green Ambassador Programme has helped Origin Green have a big footprint internationally. The programme places graduates in leading international organisations to help to spread the Origin Green message internationally, as well as develop Ireland’s knowledge of best practice in sustainability. Participants also complete an MSc in Business Sustainability with Michael Smurfit Graduate Business School. Initially the approach regarding the Origin Green programme was to build scale and bring companies on board. Now, Bord Bia is making the charter more robust and is incorporating elements of consumer feedback, such as the introduction of a mandatory health and nutrition target for manufacturing companies. Bord Bia are currently transitioning all of their Quality Assurance schemes to Sustainable Quality Assurance schemes and are further building the retail and foodservice side of the programme. Overall the aim is to build more scale, more impact and more targets, and ultimately, more proof of the Irish food and drink industry’s commitment to sustainability. Find out more about Origin Green here.